From the Swrve perspective, attribution is treated like a normal user update event, and we populate our User Acquisition report with data from specific user attributes: Swrve.referrer_id and Swrve.referrer_cost. The User Acquisition report shows important details on your attribution networks. The report is enabled on a per-dashboard basis. If enabled, it displays under the Analytics menu on the Swrve dashboard. If you would like this feature enabled, contact support@swrve.com. The User Acquisition report contains per campaign details on how much money users from any given campaign are spending and supplies calculations to easily identify how successful each campaign has been. Beyond the User Acquisition report, you can use the campaign ID and referrer cost as an audience targeting filter or a condition for a segment. This means you can track the real behavior of users from a given ad campaign or referral source. User acquisition data is displayed on the User Acquisition report in the Swrve service. For more information, see User Acquisition report. This article references Swrve’s URLs for all data and content stored in both our US and EU data centers. Use the relevant example based on your app configuration. For more information, see How do I configure the Swrve SDK for EU data storage? Apple has removed access to unique device identifiers for iOS devices, so tracking acquisition for iOS applications can be tricky. In addition, no referral information is passed from the app store to your app, so you must partner with a third party ad network or attribution service to get ROI data for iOS. The possible options are outlined below. Swrve has partnered with MobileAppTracking, from HasOffers, to make tracking as simple as changing one line of code in your app and setting up a postback with Hasoffers. The integration procedure is outlined on the Mobile App Tracking tab. Note that this only works if your ad network is using the exact same ID as your Swrve ID. Swrve recommends using ID for Vendors and discourages the use of ID for Advertisers as users can opt-out of this or reset their ID, causing inaccuracies in tracking data. You can upload a CSV file with user acquisition data to populate the User Acquisition Report. This is only supported for apps with less than two million users. Step 1: On the Analytics menu, select User Acquisition. Step 2: On the User Acquisition Report screen, select Upload Acquisition Costs. Step 3: Create a CSV file of up to 1,000 lines formatted as user id, acquisition cost. The first column of the CSV file must contain the Swrve user IDs, while the second must contain the acquisition cost (in dollar cents) for these users. For example, a CSV file with the line 12345, 7.5 indicates that the acquisition cost for the user with ID 12345 was $0.075. Step 4: Select Choose File and select the CSV file you want to upload. Step 5: Ensure the ID selected in the Referrer channel and Referrer campaign list is the same as that used in your CSV. As of Swrve Android SDK v4.6, by default the SDK does not catch the com.android.vending.INSTALL_REFERRER broadcast from the Google Play store containing the referrer details. For more information on the Android Manifest Merger, see the Android Gradle Plugin User Guide. api_key – the api key for your app. user_initiated=false – this specifies that the user did not trigger this call to the API, so it does not affect DAU metrics. swrve.referrer_id – this includes the publisher name (or publisher name and campaign name) of the user acquisition source. For example, this might be swrve.referrer_id=TapJoy.HolidayCampaign. swrve.referrer_cost – this optional parameter indicates the cost of acquiring this user. This request can be sent from either the server or the client. All Swrve requires is to see a request for that URL with the appropriate parameters. For more information on the user property message to the Swrve API, see the Swrve Events API guide. You can track ROI for Facebook Canvas apps using the Swrve REST API. The examples below use the Django framework. Step 3: Send an HTTP request to the Swrve API including these parameters in addition to the Swrve user ID and API key. For example, with swrve ID abc123 and referrer string Facebook.HolidayCampaign. MobileAppTracking (MAT) from HasOffers integrates with the Swrve User Acquisition report to make it possible to easily measure the return on investment from acquisition campaigns. To get this to work, you need to change to a single line of code and add a postback in your MAT dashboard. This single line of code informs MAT of the Swrve user identifer for the acquired users. MAT sends user acquisition data to the Swrve User Acquisition report in order to link acquisition data with users’ post-install actions and revenue. The user taps an ad for your app (in some external app); a request is sent to MAT with IDFA (Identifier For Advertising) and campaign info. 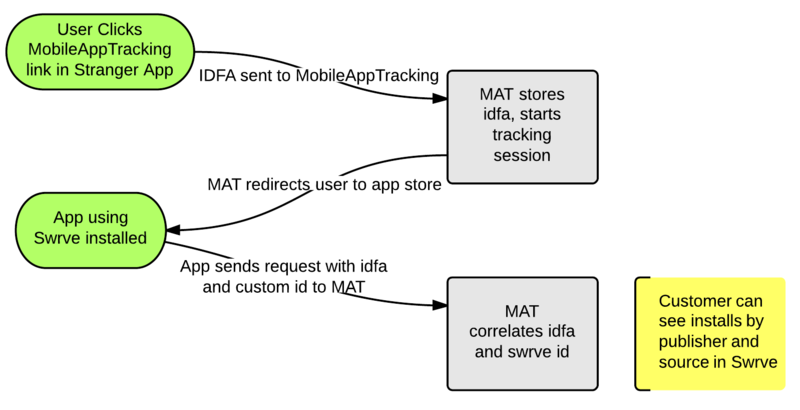 MAT stores the IDFA for the user and transparently redirects the user to the Apple app store to install your app. On first launch, your app sends the IDFA and Swrve ID to MAT, correlating the IDFA with the swrve ID and making it possible to see which installs came from which traffic sources. Android apps go through a similar data flow, but with the Play store instead of the Apple app store. To make this work, you must send the Swrve User ID to MAT within your app. // swrveUserId is the same as the user id used for Swrve. Prefacing additional parameters with UA makes it easy to see these are populated by user acquisition data sources. Step 3: Select the All radio button in the Data section on the MAT dashboard. This postback sends a request to Swrve on the first launch of your app for each user. This postback request indicates to Swrve the source and the cost of the user. You should now see installs by source in the Swrve User Acquisition Report and you should now be able to segment your users by the source channel and cost. If you are using AppsFlyer in your app, you can set up a postback which allows Swrve to track LTV and user behavior for different acquisition sources. Select your app in the AppsFlyer dashboard. Select Swrve under Media Source Configuration and enter your App ID and Swrve API key from your app’s dashboard. The App ID and API key are displayed in the App Information section on the Integration Settings screen in the Swrve service. To access this screen, on the Settings menu, select Integration settings. Ensure that you use the App ID and API key for the right app instance (normally, this is the production instance of your app). Adjust has an excellent way of handling attribution on the device, without requiring a post back URL being setup in the dashboard. Attribution handling is not synchronous, and time to fire these attribution callbacks can vary depending on attribution partner. The Swrve SDK and Adjust SDK are required to use the below method. Implement the below Adjust callback methods, with Swrve integrated to send a Swrve user update event directly from the client device. For more information on using the Adjust callback method above, see the Adjust iOS SDK Developer’s Guide. For more information on using the Adjust callback method above, see the Adjust Android SDK Developer’s Guide. We recommend initializing the Swrve SDK before attempting to use the userUpdate() method. Replace the @“publisher_name.campaign_name” with the actual publisher and campaign from the attribution object. The Swrve SDK must be initialized before attempting to user the UserUpdate() method. Beyond putting Swrve initialization earlier in your code, changing the execution order of the Swrve SDK may be needed if you see null reference errors in your console. In Unity, select Edit > Project Settings > Script Execution Order to select Swrve and put it higher in the execution order. Kochava has an excellent way of handling attribution on the device, without requiring a post back URL being setup in the dashboard. Attribution handling is not synchronous, and time to fire these attribution callbacks can vary depending on attribution partner. The Swrve SDK and Kochava SDK are required to use the below method. Implement the below Kochava callback methods, with Swrve integrated to send a Swrve user update event directly from the client device. For more information on using the Kochava callback method above, see the Kochava iOS SDK Integration Guide. For more information on using the Kochava callback method above, see the Kochava Android SDK Integration Guide. The Swrve SDK must be initialized before attempting to use the userUpdate() method. For more information on using the Kochava callback method above, see the Kochava Unity SDK Integration Guide. The Swrve SDK must be initialized before attempting to use the UserUpdate() method. Beyond putting Swrve initialization earlier in your code, changing the execution order of the Swrve SDK may be needed if you see null reference errors in your console. In Unity, select Edit > Project Settings > Script Execution Order to select Swrve and put it higher in the execution order. There are two recommended ways to review data coming from your attribution partners: by reviewing the User Acquisition Report and by creating referrer-specific segments. This report is updated every 24 hours. If the attribution data has been sent correctly to Swrve more than 24 hours ago, it appears here. To view the User Acquisition report, on the Analytics menu, select User acquisition. The information provided in the UserDB Downloads is also updated every 24 hours, and contains referrer attribution data that was sent to Swrve more than 24 hours ago. To view this information, on the Analytics menu, select User DB Downloads, and then download the Swrve User Properties CSV file (for more information, see Manually downloading user DBs). This table includes a column for the swrve_referrer_id property, which contains any referrer information that has been properly sent to Swrve. If you need to confirm that data that has been sent to Swrve within the last 24 hours, you can confirm this with the Swrve segment tool. You will need to know the name of the network or campaign being sent to Swrve. On the Manage menu, select Segments. On the Segments screen, select Create Segment. Enter the segment Name, and in the Add Filters to Your Segment section, select the Properties tab. In the Select Filter Type list, select Referrer ID, contains, and then enter the expected network in the Enter Value field. Select Add to save the filter. Select Save Segment to save the segment. After you create the segment, install and launch your app after installing from the referrer network. The Segments screen updates with user information within 15 minutes, so if the attribution data has been received by Swrve with the referrer name you used in the segment filter, DAU for this segment will increase. The referrer attribute is being rejected by Swrve due to an incorrect API key, user ID, or app ID. The referrer attribute is not being sent to Swrve. If you are using a postback URL setup in another tool’s dashboard, check the API key and endpoint where data is being sent. Ensure that this third party tool is collecting the Swrve User ID, to apply this referrer to the user’s profile. In many cases postback URLs will need to be setup in this attribution tool’s dashboard for any new app title your company has. Ensure that you are using the name swrve.referrer_id for sending the referrer to Swrve. If the name is misspelled, the referrer details do not appear on the User Acquisition report, and are not included in the available Referrer ID filters on the Engagement tab of the audience builder. To check if the name was misspelled, on the Manage menu, select Segments. Then check for any misspellings under the Properties list. Confirm with your third party attribution tool to see if the Terms of Service of your ad network allows re-attribution. In the case of some social networks or ad partners, this transfer of data to another tool is not allowed, and attribution data will appear as “Organic”, “Unknown”, or simply not sent to a third party like Swrve. Most partners do not include synchronous user attribution. In other words there is no guarantee that when a user launches the app for the first time, that this user is attributed at this time. This can pose issues when testing whether user acquisition is working or not, as you won’t be able to see the user acquisition details when launching the app on the QA logging page like all other events. If all else fails, confirm that the install is being correctly attributed in your third party tool first before being sent to Swrve. You can request logs of the requests being sent to Swrve from your partner to see if this data is being rejected for a reason other than mentioned above, and then contact support@swrve.com for assistance.